A screenshot taken on Thursday Feb.7, 2019 from an online fashion outlet showing a Gucci turtleneck black wool balaclava sweater for sale, that they recently pulled from its online and physical stores. Gucci has apologized for the wool sweater that resembled a "blackface" and said the item had been removed from its online and physical stores, the latest case of an Italian fashion house having to apologize for cultural or racial insensitivity. An influential Harlem designer says the Gucci CEO has agreed to meet him in New York City this week to discuss a sweater that resembled blackface. Dapper Dan, whose given name is Daniel R. Day, made the announcement on Instagram Sunday. "There is no excuse nor apology that can erase this kind of insult," he wrote. He said the CEO also agreed to meet with community members and industry leaders. "There cannot be inclusivity without accountability," Day wrote. 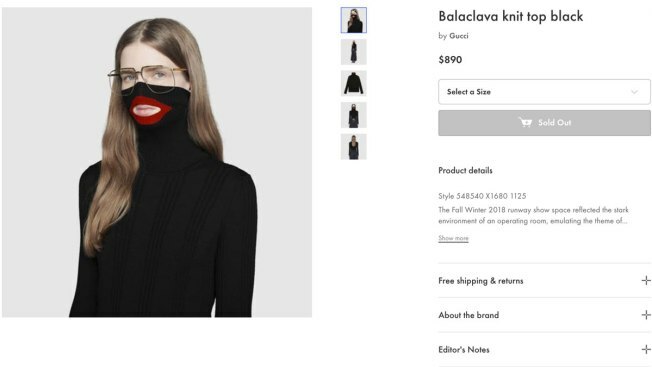 Gucci apologized for the turtleneck black wool balaclava sweater, which covered the nose and included a red cut-out for the mouth. The fashion house pulled it from online and physical stores. Dapper Dan has had previous qualms with the brand which appeared to copy one of his designs in 2017, but more recently partnered with the fashion house to open the Gucci Dapper Dan Atelier Studio, an homage to his original Dapper Dan Boutique in Harlem. Gucci's parent company, Kering, didn't immediately respond to an email seeking comment. Director Spike Lee said he would no longer wear Gucci or Prada until the brands hire some black designers, following a pair of blackface fashion fails. Prada has apologized for a monkey bag charm resembling blackface in December.